That's what my girl excitedly told me when I showed her the Fluff marshmallow spread that got delivered. S'mores is one of her favorite snacks and our ingredients are now complete. From Wikipedia, S'more, short for "some more", is a traditional night time campfire treat - mostly by girl scouts in the U.S. and Canada. It consists of a roasted marshmallow and a layer of chocolate sandwiched between graham crackers. Of course we never followed this classic way of making S'mores - no time to roast marshmallows and the kid is not fond of chocolate bars. I'm the one who introduced her to S'mores and showed her how to make one when we got our first Biscoff spread. M loves marshmallows and both kids enjoy munching on grahams. 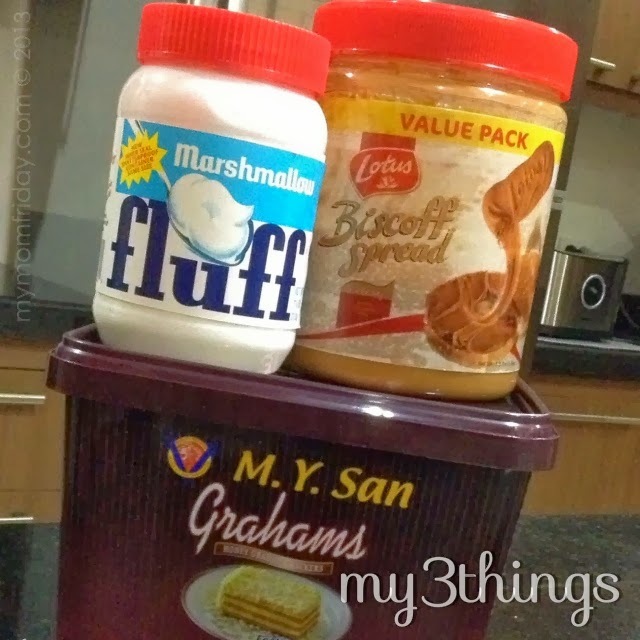 So, the first time we got our cookie butter, I spread Biscoff on grahams and sandwiched a regular marshmallow. She loved it! It's still yummy but difficult to eat. Now, there's Fluff! We always have a tub of M.Y. San graham crackers which I buy from the supermarket. Then there's our favorite Biscoff cookie butter spread here, and new Fluff marshmallow recently ordered from online store Taste Central. 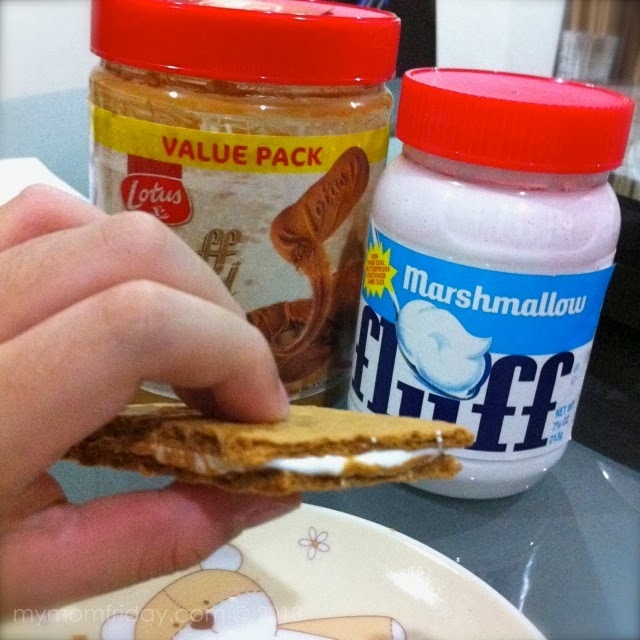 Spread Biscoff on one cracker, and Fluff on another, press together and you have S'mores!